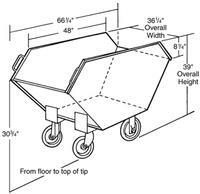 The EZY-Roll 4-Wheel Dual Tapered Tilt Trucks, also known as wasteand chip trucks, are constructed of 14-ga. steel with leak-proof solid welds on the seams for long-lasting, dependable service. The running gear of these tilt trucks consists of two fixed casters reinforced by steel tubing, and two swivel steering casters. Tapered ends allow the tilt trucks to adapt to virtually any material handling situation, and provide for safe and easy loading and unloading. Hemmed lip around the top edge of the truck provides reinforcement with bulky loads, and steel handles aid in maneuvering trucks. 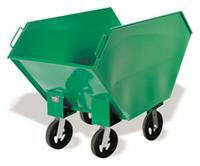 Rolls easily on two fixed and two swivel molded-on rubber casters.